This is a plea to all those business owners who unreasonably mark up their stock by more than 50% or, as seems to be the case in most stores, more than double what the exact same product costs in the US. I know you have to make a profit in order to survive but do you not see that in applying such substantial mark-ups to your products you are actually doing yourselves out of business? I have raised this point before here on CNS, and numerous business people have come back with various excuses about shipping, business taxes and import duties to (unconvincingly) justify their decisions to charge us, the customers, such extortionate prices for the items we purchase from them. Some businesses have even had the audacity to claim that because so many of us choose to buy abroad and import ourselves we are doing them out of business? These businesses are failing the people almost as much as our politicians currently are failing us with their bad decisions. Both are costing the public too much money and it needs to stop. You cannot pull the wool over our eyes and try to justify mark-ups that exceed 50%. Why on earth do you think we, the public, prefer to either go abroad to do our shopping or import it ourselves? Do you not realise that it would be easier, and we would prefer to be able to buy the products for a reasonable price locally? Do you think we really want to go through the hassle of buying from abroad and waiting for our productsto be delivered or do you realise that we do this because it’s a necessity, particularly in this day and age when the cost of living in Cayman is so high comparative to our earnings? I recently made a purchase and had it imported from Hong Kong. In total, it costs me CI$78.03 including shipping and import tax. The exact same item is on sale locally for CI$140 – and that’s what influenced my decision to import my own. I’m glad I did. As you can see I made a huge saving. I recently bought Adams Plus Pyrethin Dip for my dogs from a local store for CI$21/US$25.60. The same item costs US$9 in the States. I now import that myself too – total cost to me less than C$13 including shipping and import duty. If I know someone going over to the States, even better still – I give them a shopping list to take with them! Let’s not forget that we, the people and your prospective customers, are individuals, and therefore do not have the option to buy in bulk as businesses do and thus obtain further saving through bulk buy discount. This is the norm to you guys – so I know you are bringing in these items for much less than the cost to me. And these are not luxury items I am speaking of, just plain ole necessities that I am sick of paying unreasonable amounts for on-island. Do you not realise that if you would just drop your mark-ups to something reasonable we wouldn’t have to go or order off-island and you would be making a heck of a lot more business, not to mention profit? Just putting some food for thought on the table. Hope you are listening. (CNS): Police have now confirmed that two men aged 29 and 32 have been arrested on s suspicion of supplying controlled drugs after a joint operation at the waterfront in George Town. At about 1.30 pm yesterday afternoon (Tuesday 25 May 2010) in a daylight operation, officers from the Drug Task Force, the Uniform Support Group and the Hotspot Team converged on an undisclosed location in the George Town harbour area. As a result the two men were arrested on drug related offences and a quantity of ganja and cocaine was recovered. Police said the two men remain in police custody and enquiries are ongoing . (CNS): Police said that a 27-year-old woman is now in custody following a Royal Cayman Islands Police Service operation on Cayman Brac this morning. 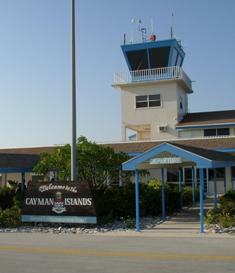 The operation formed part of an investigation into the theft of a watch which was reportedly worth thousands of dollars, from a house in the Stake Bay area of Cayman Brac on Saturday, 22 May 2010. At about 7.30 am this morning today, Wednesday 26 May 2010, RCIPS officers arrested the 27-year old suspect as she arrived at the Gerrard Smith International Airport to leave the island. Police said the watch has now been recovered and the woman, who was arrested on suspicion of theft, remains in police custody as enquiries into the theft continue. (CNS): The Cayman Islands government’s goal to significantly increase the number of tax information exchange agreements it has with OECD countries continues with Cayman and the government of Japan having successfully concluded negotiations on a future tax deal. 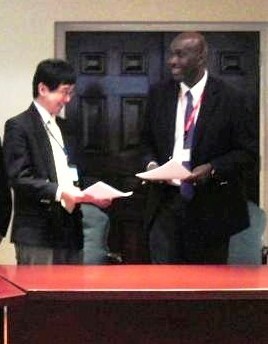 The deal with Japan will bring the jurisdiction’s number of TIEAs to 19 once it is signed. The negotiations for the agreement were held in London earlier this month between the respective delegations. The agreement will now go through the political authorisation process on both sides to enable execution at signing on a date and location yet to be determined. The Cayman Islands delegation to London included the Attorney General, Samuel Bulgin, Chairman of the Cayman Islands Monetary Authority, George McCarthy; Deputy Managing Director and General Counsel, Langston Sibblies and Senior Legislative Policy Advisor, Financial Services Secretariat, Jacqueline Jefferson-Ziemniak. In addition to terms under which tax information will be provided, the agreement will also include provisions for the allocation of rights of taxation with respect to income of individual residents of both countries. The agreement will now go through the political authorisation process on both sides to enable execution at signing on a date and location yet to be determined. (CNS): Police have said that George Town detectives are investigating another early morning mugging by a masked man with a suspected firearm – the second in 24 hours. The incident took place in the early hours of this morning (Wednesday 26 May) when a local business owner was robbed of his night takings. Shortly before 1.00am today the man, who owns a licensed premises in the George Town area, arrived at his home address in Crewe Road, close to Ryan’s Retreat. He was accompanied by three friends and was carrying a bag containing the evening’s business takings. As he left his car to enter his house he was confronted by a masked man armed with what appeared to be a handgun. The suspect threatened the local businessman before grabbing the bag of cash and running off towards Ryan’s Retreat. Police said that no shots were fired and no-one was injured in the incident. The suspect is described as being 6’1” in height, slim build with a light brown complexion. He was wearing a grey hooded shirt and long dark pants. The suspect’s face was hidden by a plastic mask. Kennett went on to appeal specifically to members of the business community. “Please take every precaution when carrying cash. When leaving your premises with cash you should vary your times, vary your route, always make sure you have people with you. Most importantly you should, whenever possible, deposit takings in a night safe and not take them to your home address,” the senior detective added. The incident comes in the wake of yesterday’s news that a 20 year old woman was robbed in the area of Queens court Plaza in the early morning hours of Tuesday 25 May. Anyone with information about this crime should contact George Town police station on 949-4222, the RCIPS confidential tip-line 949-777, or Crime Stoppers 800-8477 (TIPS). The minster said the project couldn’t have come at a better time. “Given the government’s mandate to cut costs, the savings in labour means that we will deliver this project significantly under-budget,” he added. 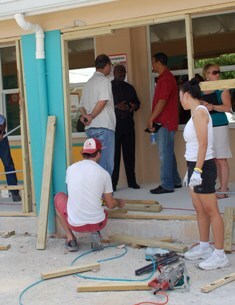 The expansion was undertaken by volunteers associated with the Miles Ahead: Do Something World-Cayman Festival. John A. Cumber’s two-phase expansion project is scheduled for completion this summer this first part added outer walls and electrical installations, while the next phase, to be completed after school closes for the summer, includes demolishing existing concrete walls. Shifting from building classrooms to building healthy children, the volunteer team’s medical professionals also spoke with the young students about their diets, diabetes prevention, hypertension, and lifestyle choices. During the seminars a nurse on the team used felt boards to present diet information and discussed ways to address hypertension. A diabetes expert presented blood glucose sticks, showed the children how they worked, and how sugar flows through the body. Another team led a discussion on abstinence and healthy lifestyle choices. The Do Something World initiative was founded by pastor and author Miles McPherson, and brought to Cayman by the Cayman Islands Ministers Association. During each campaign Miles Ahead partners with business, civic and church leaders to find sustainable solutions to community problems, by harnessing the life-changing power of volunteerism. 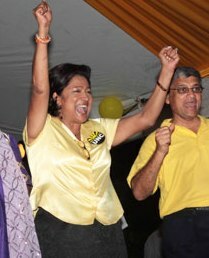 (T&T Newsday): PRIME MINISTER-elect Kamla Persad-Bissessar, 58, will be sworn in as Trinidad and Tobago’s first woman Prime Minister by President George Maxwell Richards at a ceremony at the Knowsley Building, Queen’s Park Savannah, Port-of-Spain. During another day of frenetic activity as the political landscape of Trinidad and Tobago came to terms with Persad-Bissessar’s victory, yesterday, the PM elect spent the day in meetings and in consultations with members of the People’s Partnership coalition which includes the UNC, COP, TOP, NJAC as well as the MSJ and members of YesTT. (CNS): The country’s politicians say they are no longer prepared to take the major pay cuts originally proposed in the Legislative Assembly earlier this year. The premier has confirmed that he will not be taking the 30% cut in his own salary as stated in the LA and his fellow legislators will no longer lose 20% of theirs. Instead, all members will be taking a 3.2% reduction on their average $120,000 annual salaries, in line with the cuts impacting the wider public sector which begin on 1 July. McKeeva Bush originally announced in the LA that he was cutting his own pay by 30% and his colleagues by 20% and that the MLAs would all be paying a 50% contribution to their health insurance. However, News 27 reported last night that the premier has admitted this proposal has been dropped in favour of the 3.2% cut and retention of benefits. In March Bush had said that members of the House had to set an example given the dire circumstances surrounding government finances and MLA salaries would be the first pay cuts before government began to cut other public sector workers’ remuneration in order to address the budget crisis. He added that members of the United Democratic Party agreed that elected members of the Legislative Assembly must set an example. 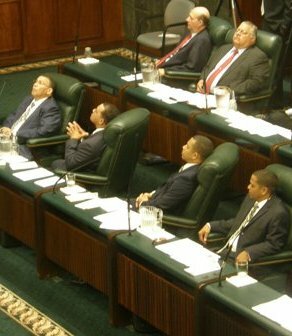 “We agreed that effective March 2010, the premier would have his salary reduced by 30% and all other elected members of the House would have their salaries reduced by 20%,” Bush stated. He said constituency allowances would not be cut but government would require elected members to pay 50% of their health insurance premiums. (CNS): The elected arm of government, the opposition, the churches, the Chamber of Commerce and the Human Rights Committee have all said they want to see the transcripts of the Constitutional Talks released to the public. However, the Cabinet Office has still not made the documents available, despite the ruling by the information commissioner last week. CNS contacted each of the parties involved in the talks to find out if any objected to the freedom of information request by the Human Rights Committee for the transcripts to be released and none of them did. Following the revelation by the information commissioner that the UK is not objecting either, there no longer seems to be any legitimate reason for the transcripts to remain under wraps. Sara Collins (above), who was at the time of the negotiations chair of the Human Rights Committee, explained that the HRC made the request some time in March/April 2009. “At the time, there was a lot of public debate about what actually occurred during the negotiations. We wanted to check the record of the negotiations for the bill of rights in the context of that debate and requested a copy of the transcript in our capacity as participants to the talks. Our request was refused,” Collins said. However, following an internal review and mediation, Information Commissioner Jennifer Dilbert made a ruling on Friday 21 May that the release of the transcripts was in the public interest and the Cabinet Office should release the documentation as requested. “I think the disclosure ruling is correct and significant. This transcript is an important part of our country’s historical record. The fact that the FCO withdrew its initial objections to disclosure suggests that the original reasons for withholding the document could no longer be valid concerns, if they ever were. The outcome of the negotiations is now a fait accompli, since the constitution was approved by referendum a year ago. When all relevant factors are weighed in the scales, it is sensible and appropriate to release the records now,” Collins added. However, McKeeva Bush stated emphatically that he, as premier, and his UDP party delegates who attended the talks were in favour of the release and had been since the negotiations with London began when he had requested that the talks be held in a public forum. Although at the time the UK had requested the talks continue behind close doors, the information commissioner indicated in her ruling that the UK had lifted its objection in November of last year. The PPM stated that it now had “absolutely no objections” to the transcripts being released and Wil Pineau also revealed that the Chamber of Commerce was completely in favour of the release. The most tentative of the representative of the talks was Pastor Shian O’Connor of the Seventh Day Adventist Church, who said he could understand why there may be some reservations over releasing the documents. Although he said there was nothing in the deliberations that needed protection from public scrutiny, one had to be mindful that the release could be used for purposes not intended. He said parties may have a legitimate expectation that those transcript would be kept in private since there was no indication that subsequently they would be made public. However, O’Connor did not say that the Seventh Day Church objected and stated it was “indifferent” as to the outcome of the decision. The HRC request was for the full transcripts of all three rounds of talks, which Dilbert has now ordered to be released. The Cabinet Office had 45 days to release the documents or seek judicial review. The information commissioner said there was no evidence the release of the transcripts could cause harm.